Which does nothing to explain him splitting time and also working with Gaine. That didn't happen on OB's authority. He's like the new entry level guy on the job. If the boss wants coffee he gets it for him. If the bosses secretary wants him to run off some copies he does that for her etc.. Agreed, I'm a little worried about all of the 1st time HC's. Although they all know BOB's/RAC's systems can they teach it with so little coaching experience? AJ will have a lot to learn but fetching coffee isn't one of them. I do think hiring former players should be encouraging to the present players. All what HC's? And why would they try teaching BOB's/RAC's systems? Dude! Really? Please tell me you don't really believe this! But it's what graduate coaches do in college and what entry level coaches do in the NFL. They are the lowest on the totem pole also they are the least paid. I know your comment about coffee is hyperbole but he'll certainly be at the bottom of the totem pole. Is he really like other additions though? Says he's a special advisor working for both gaine and ob. What the hell does that entail? I imagine he and OB had a very honest conversation previous to his hire. So my question probably IS stupid. Cant help asking though even if it has no merit. They don't all come in anywhere near the same. Might note the new name they came up to distinguish him from the typical entry assistant coach. And entry level assistant coaches don't advise the GM or scouts. They don't all come anywhere near the same. Might note the new name they came up to distinguish him from the typical entry assistant coach. Just like any new entry level guy within the org. What's the new title they came up with for AJ's job? What do you think he will be doing? Bottom line for me is if BOB didn't want him on his staff he wouldn't be on his staff. Atleast that's how its been with every other coaching hire in the BOB regime. ...At least that's how its been with every other coaching hire in the BOB regime. But they're not calling him a coach. And to answer your question I genuinely have no clue what he'll be doing. Considering his history with the franchise though he'd be suited for pr and work with the wr's. Maybe a pro mentor of sorts for the incoming rookie class? I think this is what AJ will be doing too. But if BOB didn't want AJ to help out with the WR's he would just be a PR guy. BOB wants AJ to help with the WR's after seeing him work with Hopkins on a 1st hand basis. But if BOB didn't want AJ to help out with the WR's he ould just be a PR guy. BOB wants AJ to help with the WR's after seeing him work with Hopkins on a 1st hand basis. No matter the circumstances, and again perhaps my question about lingering resentment was dumb, I am glad to have him on board. I dont think there was lingering resentment from mgmt/BOB's side. I do think it took AJ a few yrs to get over being released by the Texans org. Texas Jake, CWTexansFan and powda like this. steelbtexan, CWTexansFan and JB like this. Dear Andre... A letter to No. 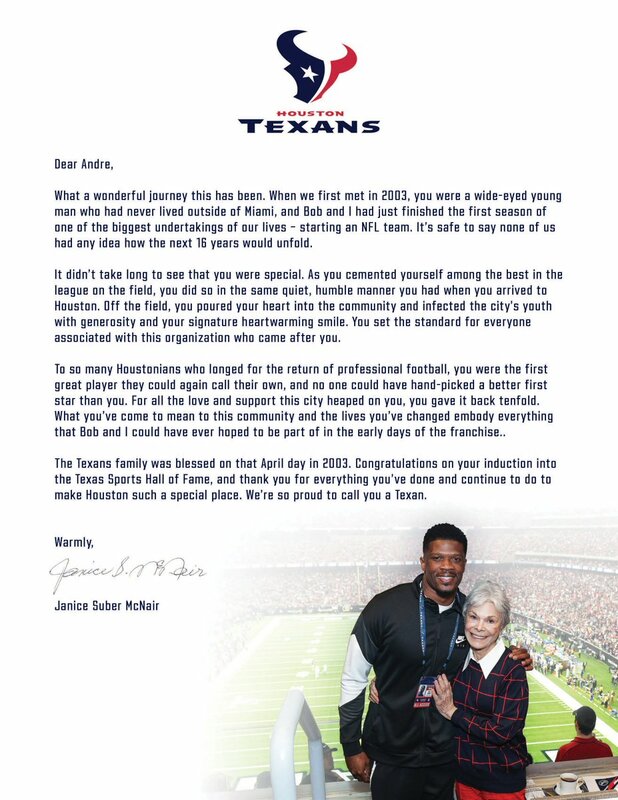 80 from #Texans Co-Founder and Senior Chair Janice McNair. Speedy, Carr Bombed, KA4Texan and 5 others like this.